An Isolation diaphragm is a thin membrane which is used to isolate the media on one side of a diaphragm from media on the other side, whilst allowing the transmission of pressure with minimal loss. Isolation diaphragms are also known as diaphragm seals or isolating diaphragm seals. Isolation diaphragms are incorporated into some core pressure sensor technologies to protect the various components used in the design from exposure to a corrosive pressure media and to provide compatibility with a broader range of liquid and gas types. Typically the space behind the isolation diaphragm will be filled with a silicone oil which is a good electrical insulator with a low freezing point and vapour pressure. Where are isolation diaphragms used? 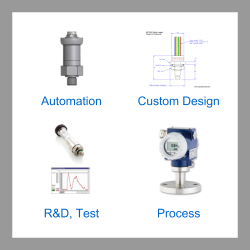 In terms of modern pressure transducer design, the sensing elements have been developed into much smaller packages with more sophisticated performance. This is particularly true for semiconductor strain gauge sensing diaphragms which include several materials and microscopic electrical contacts in the construction. For most applications that involve humidity or corrosive liquids and gases, the semiconductor sensing element would not last long if exposed to these conditions. However if the semiconductor sensing element is placed inside a capsule with a thin isolation membrane which is filled with a dielectric oil it will be protected from corrosion and electrical damage whilst retaining its high level of performance. Another use of isolation diaphragms is for adapting a pressure sensing device to an application it was not intended for. The most common applications requiring this modification is use on high temperature media. If the media is at a higher temperature than what the pressure transducer is rated for, an isolation diaphragm and oil filled seal fitted to the process connection will allow the heat to dissipate thus lowering it to within the pressure transducer’s specification. Add-on isolation diaphragm assemblies are also used to separate highly corrosive media from instrumentation which would otherwise deteriorate or fail when exposed. If the media is food or drink it is not acceptable to use a device filled with a substance that would contaminate the product if the diaphragm failed, and since many oil filled sensors contain a fluid that is a potential contaminant, it is necessary to add-on an isolation diaphragm seal containing a food grade oil. 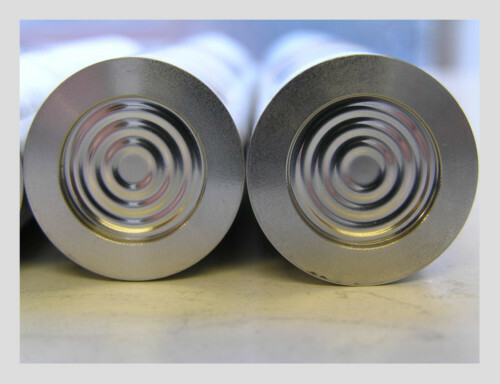 Isolation diaphragms are often made from materials with different corrosion properties such as Stainless Steel 316L, Hastelloy C276, Duplex, Titanium, Tantalum or Monel, expanding the media compatibility of a product. Send us your enquiry for a product associated with this Isolation Diaphragm page, and get assistance with selecting a product for your application.